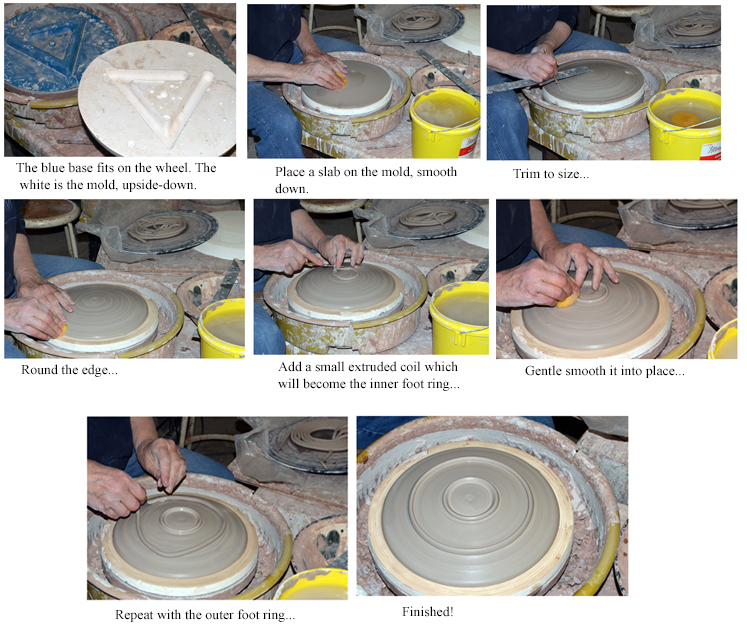 An occasional blog about pottery, making pots, and living the life of a potter. Sometimes making pottery is fun! Often, it's work, enjoyable work that keeps me challenged and interested, but still work. My 'Bird' pattern, however, has been fun lately! I'm quite pleased with them although I have to admit they are starting to look like fabric designs. I make too make designs. If I just made brown bowls, I'd be able to get caught up and I'd always have whatever people asked for. If they asked for butter dishes, I'd have them. 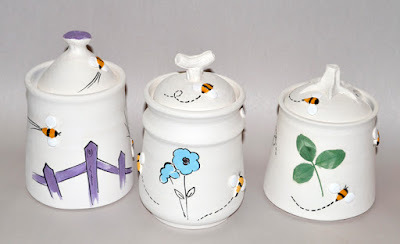 If they wanted honey jars, I'd have them. Plates, mugs, teapots, I'd have them. But am I smart like that? Noooooo, I have to make a line decorated with Pansies, one decorated with Tulips, one with Pine Branches, some in a reddish-brown glaze that I call Red Fox and so on. So I'm never caught up and customers are forever asking for something I don't have. Frustrating for both of us! I have a hunch that if you only show blue mugs, nobody will ever ask for green ones, or red ones. But the minute you put out mugs in several colours, they ask for them in any other colour than what you have. Put out blue ones, pink ones, white ones, brown ones... and somebody will ask for orange. In my next life I'm only making mugs and bowls and all of them brown. Oh, and the Maple Run Tour? It's April 6 and 7, all around Pakenham and area. I'll be at Cedar Hill Schoolhouse. My Birds and I hope to see you there! 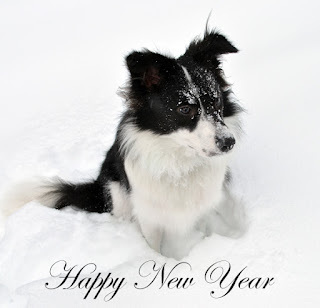 A new year! To paraphrase Anne, of Green Gables fame, "just think, a whole (year) ahead with no mistakes in it yet!" So I have one resolution for 2019, and it is: try not to make so many mistakes. I've made a Plan. I've listed all the events/sales/markets etc. that I usually do. I've listed some new ideas I'm definitely going to work on. I've listed what equipment needs maintenance and how I'm going to do it. I have Goals. As they say, a Goal without a Plan is just a Dream, but I cleverly made the Plan first. I'm not going to spend January and February doing paper work. It's already done! Soon as the T-4s arrive, boom, I'm getting my income tax done. No procrastinating, then rushing, then getting something wrong, then racing around to correct it.... nope, not this year. I'm not going to push away thoughts of a big order I knew darn well I needed to start on in June until the end of July and then working long days to get it done by deadline. Customer doesn't get their s..t together to finalize their order so I can start on it, I'll them I can't do it. For sure. Maybe. I'm going to make those large Red Fox mixing and bread making bowls which were ordered if it kills me. I'm not going to get too much glaze on them so that it melts and runs and attaches the pots to the shelves... I'm not going to accidentally over-fire the kiln so the bisque fires to glaze temp and the ware is ruined because now I can't get the glaze on... I'm not going to finally achieve half a dozen nice looking bowls which, when I bravely measure them, are all 1" too short. It can be done. Concentrate, pay attention, bribe the Kiln Gods... whatever it takes, I need those 3 customers off my neck. I'm never again going to listen to customers who sail into my booth, look around, and ask for some design which they don't see, and then promise to make some soon. They never meant to buy any, they were just letting me know they weren't buying my work, and IT WAS MY FAULT. So phoo on them. Don't see any Pine and Winterberry? Tough bananas. Things are still kind of weird around here. After my Rotten Week in May, it took all of June and some of July to get back to feeling normal, at least as normal as it ever gets around here. In addition to all the stuff happening here at the Studio, we've also had the Ontario election, and no rain. Not that there's a connection there, but neither one of them has contributed to the general happiness at Pine Ridge. Add in the high cost of gas, which leads to low sales of pottery (yes, there is a connection there) and you can see why my mood has been, shall we say, low. I finally hit on the word 'defeated' to describe how I felt and I think that fits. 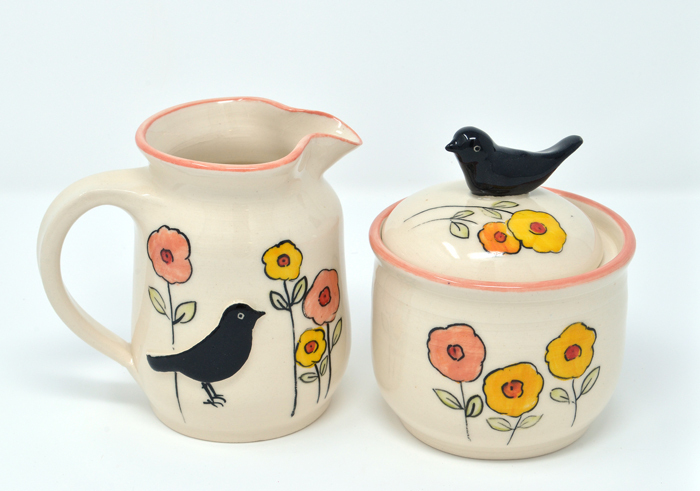 Last year, sales of my pottery were good. I ended up the year with some actual money in the bank, and, perhaps dangerously, the feeling that maybe I finally knew what I was doing. Ah, pride. Yes, even if it doesn't lead to a fall it does make the crash more painful. Sales this year were fine the first few events, then the election uncertainty took hold and they plummeted. So now I'm halfway through the year and sales are less than half of what they were last year at this time. Craftspeople often talk about sales: why they are low, what we can do, how we can predict... the weather is a handy scapegoat. If the weather is bad, we say customers didn't come because the weather was bad, when it is good (the weather) we say customers didn't come because the weather was good and they went to the beach instead. Could be, but what I am sure of is that the worst thing for sales is uncertainty. And an election upsets everybody, especially in a government town like Ottawa. Half the people are worried that if so-and-so gets elected their jobs will be at risk, and the other half worry that if so-and-so is not elected, their jobs will be at risk. Either way, everybody is worried. And worried people don't buy mugs and bowls. And of course the more serious uncertainty in the Western world due to the sudden trade wars between ourselves and our Large Neighbour is of course making everybody even more nervous. And nervous people don't buy mugs and bowls. I've had to warn Rosie that if things don't improve, Milkbones will have to be rationed. Rosie is more worried about the continuing dryness. It makes it so much harder to dig up chipmunks, her favourite hobby. We really haven't had rain for over two months. Wind storms, extreme heat, a few sprinkles, but rain, no. The Maple trees in the woods are wilting, my rock garden is a more of a plant graveyard than a garden and my ferns are in dire straits. I know it's not as important as farm crops, but my garden, my ferns, and my woods, mean a lot to me and seeing things drying to a crisp is most depressing. I'm now watering, small bit by small bit, just to try and keep my ferns and my small conifers alive, but that's putting a heavy strain on my well and risking a pump failure. My well is only 5 gallons per minute, which is not a lot of water, and it is 275' deep. My line of credit at the bank and I live in fear of the pump failing. They aren't meant for continuous use. But this past week, and in spite of everything, my mood seems to be improving. I've been in the dumps, now I'm starting to think positively again. If sales are low, I will build up stock. It might rain next week (supposed to, but can you believe forecasts?). Rosie can switch to no-name dog treats. And I've got mugs and honey jars started. Honey jars ready for glazing! 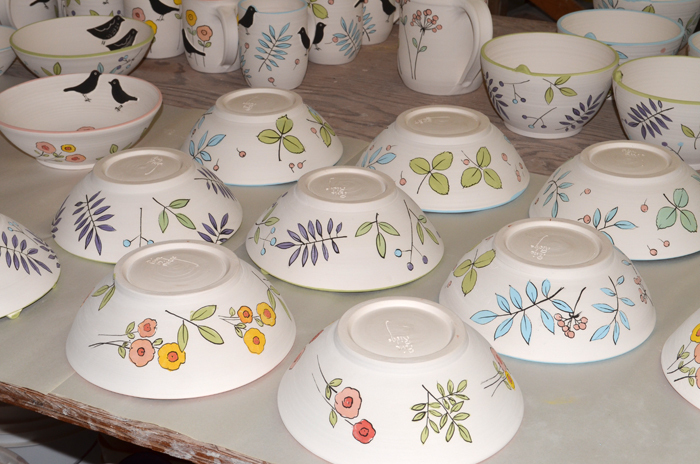 They're waiting to be glazed and fired, and then they'll be ready for the Market on Saturday. It's Honey Day, so I'm at least on theme! Thursday. My small kiln over-fires a bisque load. It wouldn't be too serious except that it contains the vases I really wanted to complete my display at the Carp Farmers' Market, which is opening in a week. 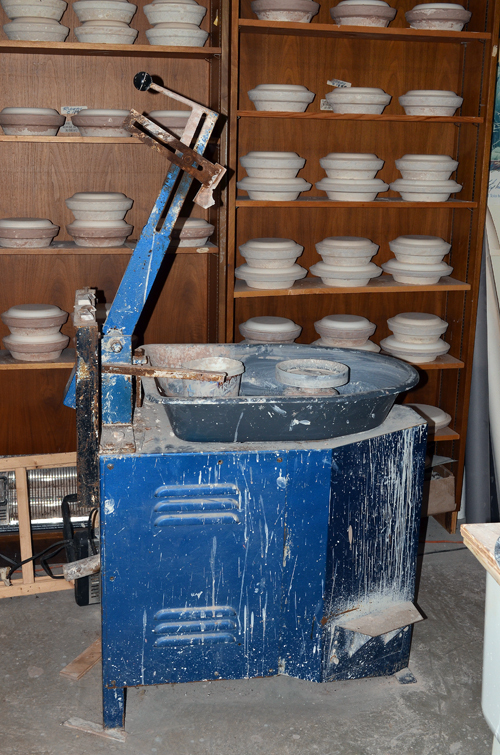 This is my trusty, 30+ year-old Alouette kiln. Built by Eric Jackson, a true Free Spirit, who I always remember as telling me once: 'Everywhere I go, a slow truck is following ahead of me'. He built many excellent kilns and we potters were all sorry when he quit and took up motorcycle maintenance. Now I can no longer get the little metal prongs that support the mini cone in the kiln-sitter, nor can I get a new kiln-sitter. Today's kilns are all computer-controlled and the old manual technology is gone. I heated the vases and dipped them in the glaze and fired them and they look OK but can't be sold because not enough glaze got on and they are rough. Sigh. Friday. Everything set up at the Market - my booth looks great but needs those vases - and I'm feeling pretty good. I see on the news that we are to have high winds but it doesn't impress me. At supper time it's pretty gusty out there but I'm not concerned. At 9:00 pm. the power goes out. Ok, I'm impressed. I step outside and whoa, the wind just about knocks me off my feet. Rosie the dog won't go out... now I'm concerned. My roommate and I play Scrabble by the light of an old oil lamp and try to ignore the bangs and cracks and crashes and other horrible sounds coming from outside. Saturday. In the morning there are trees down everywhere. There is one leaning over the driveway, one leaning ready to fall onto my hydro line at the next possible opportunity, one crashed down into my Crabapple garden, a huge Pine which was the visual corner of my Hillside garden is roots-up, the top of another huge Pine is flat across my septic field, and, scariest of all, the top half of a large Cedar is hanging over the driveway on the power line. I am impressed, concerned, and dismayed. First question, who do I call? Sunday. Power still off. Trees still down. Roommate and I go for a walk in the woods and it is clear, I no longer have trails. So many trees, old, dead, live, young, healthy, pines, balsam firs, spruces, all crashed down every which way. On my neighbour's side at least 12 of his wonderful 160 year-old Pines are down. One of mine, which had a diameter at the base of over 6', is roots-up with a root ball at least 12' high. Many of these trees were personal friends. I know they are only trees, but I feel bereft. Monday. Can't really work at anything. 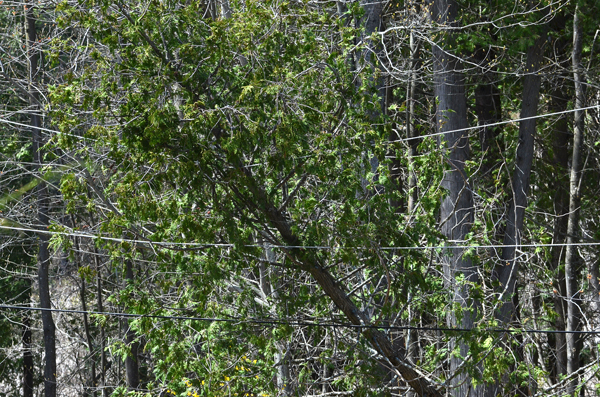 Trying to call tree companies, finally get through to Hydro to schedule a crew to get the Cedar taken off my line. Too dark in the Studio to do much of anything. Power comes back on at 6:00 pm. I was just putting some cold drinks I had gotten as part of our take-out KFC supper in the (warm) freezer, thinking they would stay cool in there for a few minutes, when the compressor came on. It took me a few seconds to realize that not only was this unexpected, but also it meant the power was back on. 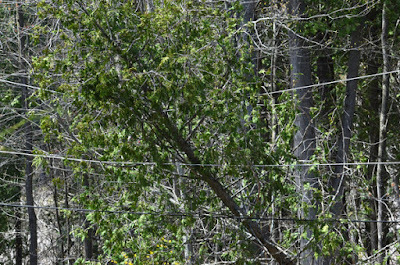 Cedar is still hanging on the power line. I don't want Rosie going anywhere near it, but just try to keep a young energetic Border Collie away from a spot on the driveway. Tuesday. Hydro says a crew has been dispatched. Worked in the pottery and got some stuff finished. Trying not to look at the mess all around me. Wednesday. Culvert Man comes and digs up the driveway and installs a culvert. The driveway has been acting as a dam and not only is the area on one side consistently flooded (bad for Pines), but also when the water gets too high it washes across the driveway, leading to potholes, crevasses, mud swales and other vehicle-devouring artifacts. Dog wades around in the now-muddy water, drinks the stuff, and shakes herself dry all over Culvert Man. He laughs. I wash dog. Thursday. 8am. Large Hydro truck arrives and tells me my power is going to be off for a bit. Since I was expecting this, having asked to have it turned off so the tree people could do their work, I'm not surprised, but it did seem an odd way to phrase it. 8:05 am. Second large Hydro truck arrives. Says, 'you asked to have your service temporarily disconnected, Ma'am?' We are standing around wondering why there are two trucks when a third one arrives. The Hydro men gather to confer. 8:10am. A large Davey Tree Experts truck arrives. Hardly room in my driveway for all this truck power! The Hydro guys sort themselves out, one telling me to have Davey Tree etc. call them when their work is done, one leaving, and the last one getting themselves into place to remove the hanging Cedar. Davey etc. are three young guys who attack the various arborescent insults and reduce them to logs, piles of branches, and chips. Cheerfully, and with dispatch. 4:00pm. Fallen and leaning trees in the garden and driveway all gone. Davey Tree Experts experts all gone. Hydro gone. Power back on. Friday. Finish setting up my booth at the Market and it looks good. Need fresh flowers in the morning, and must finish my poster for that blank bit of wall. Poster needs words to tie it to Mother's Day. Print some large letters on the computer and go to glue them on. Oh, too big. I get the x-acto knife out to trim them. First one, no problem. Second one, no problem, done this a million times. Third one, knife skids across the metal ruler and slices into my left thumb. Blood everywhere. Ran into the house and held my thumb under the cold water. I'm holding it closed and the cold water is slowing the bleeding but I'm feeling kind of queasy. My roommate (wisely) insists we go to Emergency. I told the nice Doctor that if he was going to stitch it I would need an anesthetic or else I would scream and scream. 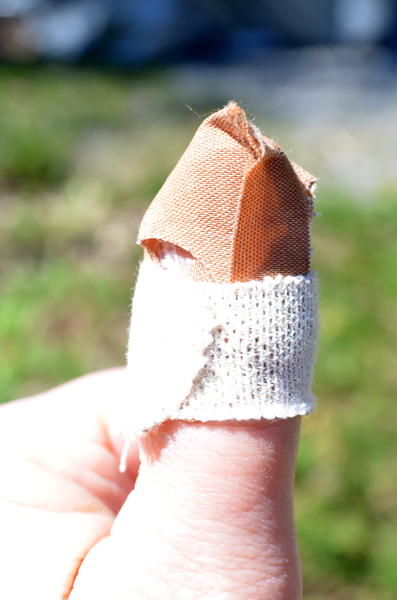 I still vividly recall getting another finger stitched years ago, without freezing, and how much it hurt. He laughs and says that because I cut it horizontally he figures his special glue strips will hold it, but I have to promise to keep it dry for 10 days. I promise, fast. It's been a plate kind of month! I had a lovely order for a dinnerware set, a workshop involving place settings coming up, and needed bisque plates to have on hand for stock, so my plate making systems got a bit of a workout during January and the beginning of February. Plates are paradoxically both easy and difficult. It's easy to make one plate. It's even easy to make eight plates, all more or less the same size. 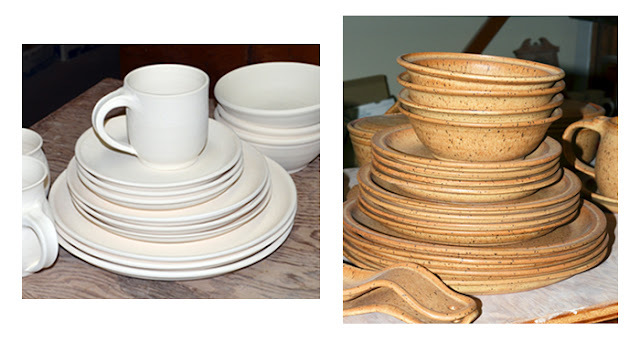 What is extremely difficult is to make a set of plates, all of which will stack neatly. Most customers want plates that will look good both while set out on the table and while stacked in the cupboard, and who can blame them. Early on in my pottery journey, I decided that trying to throw plates to satisfy this double requirement was just not feasible. I'd have to charge so much per plate I'd never sell one. So I looked around for other ways of making plates. I was delighted to find an ad in a pottery publication for a Jigger/jolley machine for sale. I called and arranged to come down and see it and said I'd probably buy it. Luckily, I had a new truck at the time, and the long trip down to Kincardine didn't alarm me. My husband and I had a fine time driving down, staying in several B & B's along the way, and duly arrived at the potter's home. He showed me how to use the machine. It looked wonderfully like the solution I was looking for. I got excited. A price was agreed upon. He also wanted to sell an old old slab roller and all the molds to go with the Jigger. I got even more excited. A further, enhanced, price was agreed upon. The men were sure the machines and molds would fit in the back of my pickup. We didn't discuss the weight! The Jigger, as I found out later, weighs about 500 lbs, and the slab roller not much less. Each mold, and there were over 80 of them, weighed at least 2 lbs. 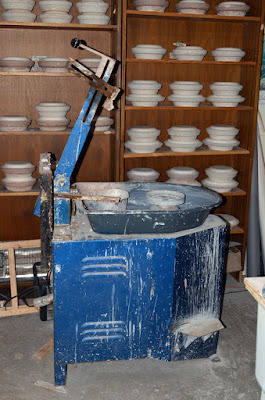 So you can imagine how I felt when the potter, who was well over 70, and my husband, a totally non-athletic absent-minded professor type, lifted first the Jigger and then the slab roller, into the truck. They said they used Zen! We drove home slo-o-wly. The truck wasn't rated for that much weight but with care we got home. It took two hired movers men to get the gear off the truck, which, when you think about it, was downhill. Robert and the potter moved them uphill! Basically, you place the mold of your choice in the 'cup' - which you can see to the right inside the grey rubber splash pan. 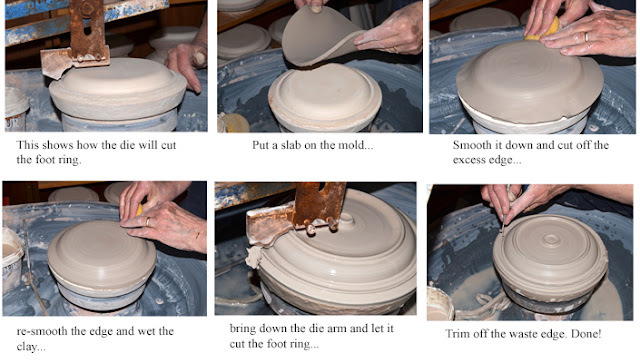 Then you place a clay slab on it, bring down the arm, and 'cut' the plate. I don't know the brand, or the age. I suspect Ratcliffe, and old. There is no info plate anywhere on it, and the innards are most mysterious. I just know to oil it certain places, and keep my fingers crossed. Plates made like that do warp a bit. It's best for 'wonky' plates, which can be quite nice! Also, you can vary the foot rings, even make quite large ones to make plates or platters with pedestal bases. The plaster mold is just sitting on top of the wheelhead. It works pretty well, but again, the platters do tend to warp a bit. My truck was OK, by the way. It went on to ferry myself and many plates for another 14 years. One of things I love doing in January is planning my pottery year: what workshops to offer, if any, what shows to do, sales... workshops to take, projects, challenges to take on... ah, dreamtime. One workshop I definitely will do again this year is the one I called 'Making Marks on Pottery'. We did it last year and it was a great success. The creativity shown by the people who came was awesome. On the first day we decorated (made marks) on pottery place settings. I provided the bisque ware pieces (three plates, a cereal bowl and a mug in most cases) and demonstrated some ways of decorating pottery, then the students went ahead and blew right past anything I'd ever have thought of in their wonderful original designs. Later I dipped everyone's pieces in a clear glaze and fired them. A few weeks after that we had a pot-luck lunch which we ate from our new dishes. I called that 'The Artful Meal'. Seeing all the place settings on the table was totally exciting! So I'm offering 'The Artful Meal' again this year. On Feb. 17 you'll choose your place setting, learn about some pottery decorating materials and techniques, and then decorate your pieces. Mostly we'll be painting on the bisque ware so it would help to have some basic painting skills. It'll be a full day, starting at 10am, breaking for a soup & a bun lunch, and continuing until about 4pm. We'll decide on a date for our meal before everyone goes home. Including lunch, your place setting and all materials, there will be a cost of $50 per person. Since my studio isn't very large and I want to be able to give everyone enough attention, this workshop will be limited to 8 people. Another definite on the agenda is Clay Days. This is for total beginners, or people who haven't done pottery for a while. The first day of the workshop, March 10, will be devoted to learning a bit about clay and the pottery process, and making some pieces such as small bowls, pendants, tiles or other such projects. I'll be concentrating on hand-building techniques, but if someone is keen to try the wheel we can probably manage that as well. Someone with some prior experience would be free to go ahead with their own projects. 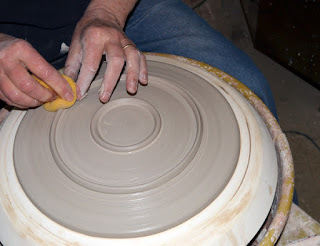 Then the pieces have to dry and be fired, so the second day, when we will decorate our work, will be the Saturday after. The cost per person will be $25 (2 days of playing with clay, lunch both days, and all materials included) and the class will be limited to 8 people. If you are interested in signing up for one of these workshops, just hit the 'contact me' button. March will be a busy month as I'll be at the Carp Farmers' Market Easter Market on March 31. The fun part is deciding what to have for sale that day, let's see, bunnies, bunnies... bunnies... ok, I'm sure I'll think of something more than bunnies well before then! Right after the Easter Market will be the Maple Run Studio Tour. Have to have stuff with Maple leaves on it for sure, and maybe some bunnies... the Tour is April 7 and 8 this year. I don't know which stop I'll be at yet, but I'll post the info in the side bar once I know. This tour has some very fine craftspeople and artists on it and I feel honoured to be on it. It's a lovely area, too, and Fulton's Pancake House always has lots going on at the same time. * With a grateful nod to Anne of Green Gables' whose lovely line, 'Just think, a whole day with no mistakes in it yet' expresses exactly how I feel about 2018! 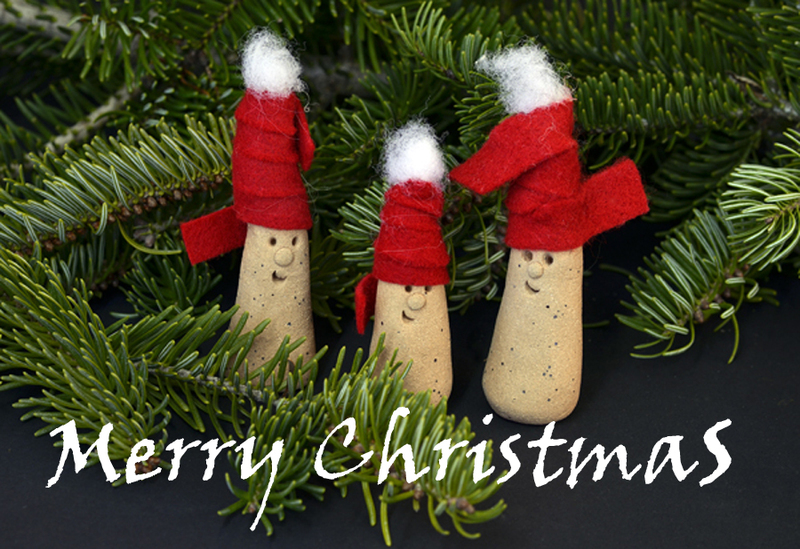 Not a creature is stirring, least of all the potter. All the orders are done. All the shows are over. The fall Studio Tour is over, my half-price sale is done. What's the difference between an Artist and a Craftsperson? Usually about $20K a year. The purpose of a to-do list is to show you how far behind you are. Never sneeze while brushing your teeth. The 'new normal' is that there is no 'normal' anymore. It doesn't matter where you start, it matters that you start. Remember: you are the one driving the bus. Not the snarky customer or the whining teenager. Smartass likes Toshiko Takaezu's Portrait of a Ceramic Artist. She says "You are not an artist simply because you paint or sculpt or make pots that cannot be used. An artist is a poet in his or her own medium. And when an artist produces a good piece, that work has mystery, an unsaid quality, it is alive". How can something be both 'New' and 'Improved'? If it's new, there was no previous version to improve upon; similarly, if it's improved, it can't be new. Sometimes, where I see beauty, someone else sees "doesn't match my sofa". A fellow I know is a one-man mutual-admiration society. I'm not poor, I'm living a low-income lifestyle. Why is it that, no matter what I do, I'm in the wrong lane? It's amazing how having something nasty to do can really motivate you to get all sorts of other things done. I like Andy Warhol's advice: ' Don't think about making art, just get it done. Let everyone else decide if it's good or bad, whether they love it or hate it. While they are deciding , make even more art.' Right. My kind of thinking. Some days you work on what is important, some days you work on what is urgent, other days you work on what is in front of you. Nothing is more tiring than thinking about all the work you have to do. Books: weapons of mass instruction. Why don't they make those little ovals they stick on apples out of something bio-degradable? .... Pine Ridge Studio! It's a one-artist pottery studio located in the Ottawa Valley near the village of Carp. I make tableware and garden pots in stoneware and porcelain. The studio is in the middle of the woods..... my other great interest is gardening, particularly with ferns and other native plants. Rosie is my new Best Dog, in charge of Friendly Greetings. She's only 18 months old so still a puppy, but is already very good at welcoming new friends. She's also very good at destroying dog toys, most of which last about 10 minutes, and loves to sleep in front of the heater in the Studio. Meanwhile Pepper, the cat, in her role as Supervisor, casts a cynical eye on all goings-on and makes Pronouncements. It's a great life and we love it! Maple Run Studio Tour - April 6 & 7, 10am to 5pm. Many wonderful fine crafts at locations around Pakenham. Carp Farmer's Market Easter Market - April 20, 8am to 2pm. The season begins! Carp Farmers' Market May 11 to Oct. 26, 2019. I'll be in my usual spot at the Market (inside at the bottom of the ramp) for my 29th year! Red Trillium Studio Tour - June 1 and 2, Studio and garden will be open for visitors. 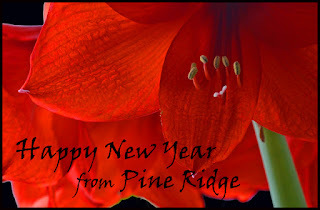 Pine Ridge Christmas 1/2 Price Sale, at the Studio, 6114 Carp Road, Dec. 14 & 15, 10am to 4pm. Guest artists, free Christmas greenery. Pine Ridge Studio - contact me to arrange a visit anytime, or come to one of my Events! Please visit the sister blog, Gardening on the Ridge.